Medjugorje boom in Italy brings much needed life to Mostar Airport where a new route to Pescara contributed to a successful 2011. More Italian destinations are announced for 2012 but the need of major investments to meet international demands is lurking on the horizon. In Medjugorje, a new local road is expected to relieve the town from traffic. Fr. Jozo Zovko brought to testify before Vatican. Vicka interviewed as well. Read more: Fr. Jozo Zovko brought to testify before Vatican. Vicka interviewed as well. There seems to be no end in attempts to make the Medjugorje apparitions go away. Once again the Bishop of Mostar who has jurisdiction over the Medjugorje region has made yet another bold demand in his continuation to stop Our Lady's apparitions. Medjugorje USA has received reports from reliable sources that the Bishop has written a letter to visionary Mirjana stating her public apparition held at the Community Cenacolo on the 2nd of each month, must stop. To ensure the public apparitions stop, the Bishop also wrote a letter to Community Cenacolo Medjugorje founder, Sister Elvira. As a result of this letter Sister Elvira received from the Bishop, Medjugorje USA have been told Sister Elvira will be obedient of the orders from the Bishop. Medjugorje is one of the towns of the Western Herzegovina municipality of Citluk (Čitluk) in the previous Yugoslavia. The name Medjugorje is Slavic and means "area between two moutains". This real life story occurs in the Bijakovici section of Medjugorje. On the afternoon of June 24, 1981, 2 girls, Ivanka Ivankovic, age 15, and Mirjana Dragicevic, age sixteen, were returning home from a walk. Looking toward the hill called Crnica, Ivanka saw a bright profile of a woman. She revealed to Mirjana, "it is the Gospa!" ( Our Lady ). Medjugorje, 1. - 6. 8. 2010. Instead it is located in southern part of Bosnia Herzegovina, which used to be a former republic of Yugoslavia. Medjugorje is not located in Yugoslavia nor Croatia, such even today some people still think. Bosnia and Herzegovina is located in Southern Europe and it's capital city is Sarajevo. Bosnia and Herzegovina is surrounded by Croatia, Montenegro and Serbia. Medjugorje is located between the city (20 km) of Mostar and coastside of Adriatic sea (part across the Peljesac Peninsula). It's in relative close location to Croatian coastal cities of Dubrovnik and Split. Medjugorje is a small town in south Bosnia and Herzegovina. It is located on Bakan peninsula, in the southeastern Europe. Bosnia and Herzegovina borders with Croatia, Serbia and Montenegro. It has an area of 51,129 square kilometers, and is almost landlocked except for the 26 kilometers of the Adriatic Sea coastline, around the country’s town Neum. Official languages in Bosnia and Herzegovina are Croatian, Bosnian and Serbian. The country’s capital is Sarajevo. The name Bosnia and Herzegovina comes from the two regions – Bosnia and Herzegovina . Medjugorje is located in Herzegovina, about 25 kilometers from Mostar. Unofficial Herzegovina’s capital is Mostar. It has mild Mediterranean climate, with hot summer and mild winter. 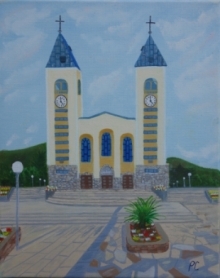 Medjugorje parish consists of five nearby villages – Medjugorje, Bijakovici, Surmanci, Vionica and Miletina. The parish was founded in late 1892 and is dedicated to St. James the Apostle, protector of pilgrims. Medjugorje currently inhabits about 4300 residents. I have tried with this FAQ to answer some of the most commonly asked questions about Medjugorje. The answers are made to be short, simple and to the point. I did not want to make this page too lengthy. I hope that you find it useful. Please also realize that this page is not meant to be a catechesis on the Catholic faith. There is lots of information available which explains our rich Catholic Faith. Rather, these questions focus more directly on Medjugorje. Please also refer to our page "About Medjugorje".